Please join me today in welcoming Alison Stuart, a fellow member of Hearts Through History. I read her article on the laws of succession in our monthly newsletter and just had to share it with you all! Thank you, Alison, for visiting with us today!!! Enjoy! Thank you, Eliza, for the invitation to post my article on the English Laws of Succession...or Laws of Succession 101. Firstly my qualifications for writing this article - I was a practicing lawyer for over 30 years in the Australian jurisdiction, which is an English common law system rather than the American codified legal system. If you are struggling with understanding the English common laws of succession then don’t panic ...most lawyers don’t understand them either. 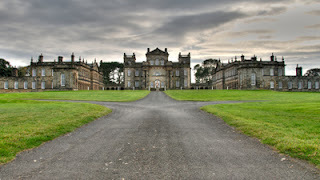 The English aristocracy depended for survival on the devolution of their estate from one generation to the next and by the mid thirteenth century the common law had set in place certain rules of inheritance which determined who could inherit based on a “parentelic” calculus (now there's a phrase that just rolls off the tongue!) ie those who could trace their blood directly to the deceased. Rather than split the ever diminishing estate between your children (as is the case in many European countries), it was determined you should only have one heir and that heir should be descended from you by direct line. Male descendents would always be preferred to female (although inheritance by female descendants was possible). The law decreed that your estate went first to children or grandchildren or in the absence of those then to brothers, cousins, nephews etc. If the deceased died leaving daughters but no sons, then the parentelic calculus would allow the daughters to inherit over say a brother or a cousin. If there were multiple males in the line then the law of “primogeniture” applied...ie it went to the first born. These basic rules of inheritance lasted into the twentieth century. However this left spouses, younger siblings, illegitimate children and daughters without any rights of inheritance. In short they could only be provided for during the life of the father. As nothing in the law prevented a newly inherited heir from selling off his newly acquired estate, to prevent a youthful heir from squandering his inheritance, family settlements, away from the will, became common. One way of disposing of property was to make a gift (generally on marriage) to the couple and their progeny eg “To H and W and the heirs of their bodies begotten”...or the “male heirs of their bodies begotten”. This gift could not then be disposed of until there were no heirs when the gift would revert to the donor. This was called the “fee tail”...or to use the word more common in our writing “entailment”. Entails in stories we are familiar with are Downton Abbey and Pride and Prejudice. In the absence of a male heir, for the direct family line to maintain a hold in the land, it was desirable one of the girls marry the heir...always good fodder for a story viz Matthew/Mary and Mr. Collins/Lizzie. I won’t go into the complications and machinations that lawyers devised to “bar the tail” - remove the tail from estates to allow the land to pass freely according to the general laws of inheritance. Succession law kept lawyers and courts busy (and still does) for years and years. Dickens wrote about this subject in Bleak House (the case of Jarndyce v Jarndyce). It is probably surprising to note that the basic laws of inheritance and entailment did not change until the Property Law Act of 1925. Example: Lord Fauntleroy is the proud possessor of Fauntleroy Park. · The estate is not entailed and he has three sons. The eldest son inherits Fauntleroy Park. #2 goes into the church and #3 into the army...If he has no sons but a daughter then the daughter inherits. · The estate is entailed and the terms of the original settlement stipulate “male heirs”. If he has a son then it goes to the son by operation independent of the will. If he has a daughter, she is excluded by the entail and the estate goes to second cousin Rufus Stuffnpuff. In the absence of any assets independent of the entail, her prospects are grim! A wife was completely outside the laws of inheritance - your estate passed to your children or through the entail. Husband and wife were counted, at law, as one person so a husband could not make a gift to his wife during his lifetime with one notable exception. A gift from husband to wife on the day they married, at the church door, could take effect on the husband’s death if he predeceased her. This was “dower” and was subject to the supervision of the church. 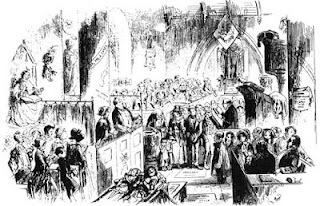 The dower lands were nominated before the marriage service, and after the husband had given his wife the ring saying “With this ring I thee wed”, he gave her tokens symbolising dower with the words “With this dower I thee endow”. 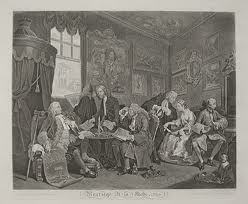 The effect of the dower was to give the wife an interest for her life in the nominated lands. If the husband died without a will, the widow was deemed to inherit one third of her husband’s estate, independent of any specific dower. However if the bulk of the estate passed outside the will through the entail, there may not have been much for the widow or other children. There was also a practice of settling land on husband and wife jointly so as to entitle the wife to an estate called a “jointure” instead of a dower. A wife could elect to take their common law dower or her jointure but not both. What if a man married an heiress? If his wealthy wife predeceased him, the widower was allowed, by law to continue to enjoy her estate for his life, providing there was a child of the marriage capable of inheriting. So in effect the husband held the land on trust for his child. This was called “tenancy by curtesy”. Alison Stuart is an award winning Australian writer of historicals with heart. Whether duelling with dashing cavaliers or waywards ghosts, her books provide a reader with a meaty plot and characters who have to strive against adversity, always with the promise of happiness together. Alison is a lapsed lawyer who has worked in the military and fire service, which may explain a predisposition to soldier heroes. She lives with her own personal hero and two needy cats and likes nothing more than a stiff gin and tonic and a walk along the sea front of her home town. She loves to hear from her readers and can be found at her website, facebook, twitter and Goodreads. 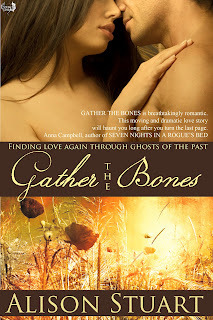 Her latest book, GATHER THE BONES, is a “Downton Abbeyesque” haunting love story set in 1923. Thanks for the lesson. I knew about dower and entailment but not jointure, so thanks. Fascinating! I notice it helps explain words like "endowment" and "entailment".